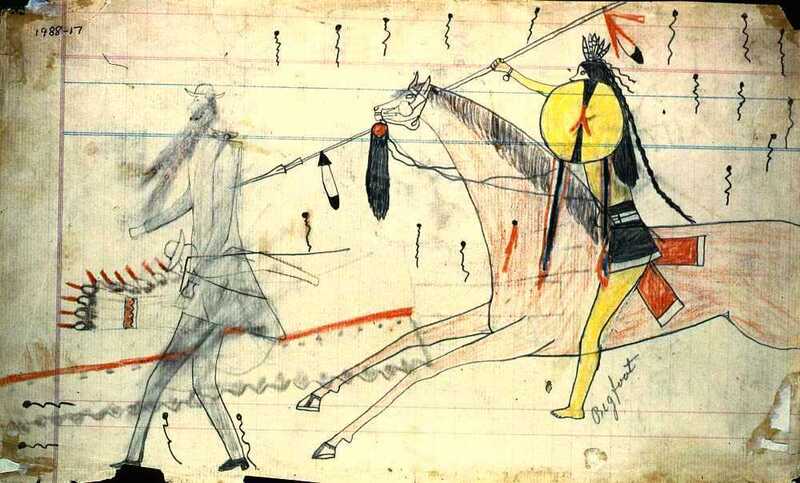 A mounted warrior, identified in the handwritten label as Bigfoot, pierces a white man with a feathered lance. What has been identified as a scalp hangs from the horse's bridle. Note the symbols for bullets surrounding the scene. The shield held by the warrior is similar to that shown hanging from a tripod in front of a tipi in the last image on this page, and it, too, is attributed to Bigfoot. Researchers have speculated that the warrior may be Si-Tanka of the Hunkapa Sioux, chief of the Cheyenne River reservation, who was killed at Wounded Knee in 1890. Note the depictions of a white man's head and a feathered bonnet and lance, drawn perpendicular to the larger scene; these are probably unrelated. TARL Archives.